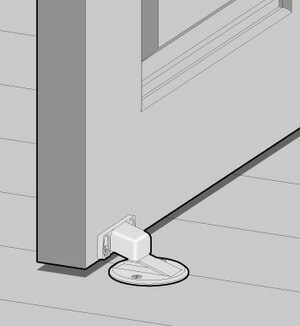 Magnetic Catches keeps doors, cabinets or cupboards open with powerful magnetic catch. No slamming doors. No damaged walls. Releases with gentle tug. Easy to install on door, floor or wall. Hardware included. HS Magnetics has a wide range of Magnetic Catches ( Magnetic cabinet door stop) for customers. 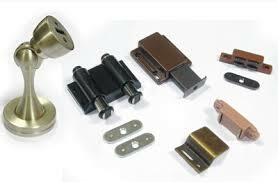 Our Magnetic Door Catches have good appearance and are widely used in office and home etc. The category have catch magnets products includ：Magnetic Touch Latches, Heavy Duty Magnetic Catches, Plastic Magnetic Catch, Metal Magnetic Catch, Sealed Magnetic Catches, Snap-In Magnetic Catch, Slide Magnetic Latch, Clip in Magnetic Catches, Recessed Magnetic Catches, Standard Magnetic Door Catchers, Magnetic Door Catchers, Knock-in Recessed Magnetic Catches, Magnetic Cabinet Catches, etc. Powerful magnetic door catchers ( Magnetic door stopper) make sure a wind gust won’t slam the door in your face when you are bringing in the groceries! Mount the magnetic post on the floor or wall, and the smaller, spring-loaded, magnetic catch near the door bottom. Also protects wall from door knob. Gently pull door for easy release. Durable steel construction with strong magnets. Screws and anchors included. Please specify bright gold, white, black or polished chrome. Suitable for use with both single and double door cabinets, the HSMAG magnetic cabinet catch is used to support door alignment and hold doors closed. The door catcher contains a high magnetism permanent magnet, which ensures the stability of the door. Compact size saves room and makes the door catcher more concealed. 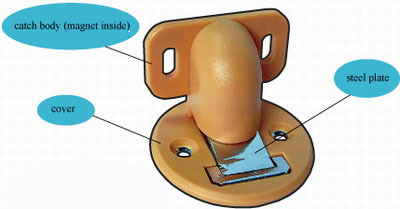 HANGSENG Magnetics has a wide range of Magnetic door catchers for customers. Our magnetic door catchers look nice and are very convenient to be widely used in office and home etc. Copyright 2018 Hangseng(Ningbo) Magnetech Co.,Ltd.| All Rights Reserved.